Let The World See Your Product As You Advertise At NaijaFlake Today!!. Looking for a place to advertise your business? NaijaFlake.com is the right place. For every great business, there is an advert. 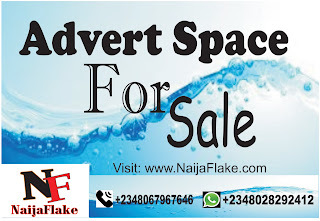 Make your business go wide in range to people as you advertise at NaijaFlake. With our thousands of viewers from around the world, we assure you of getting good numbers of patronisers on what you advertise. It's easy to advertise at NaijaFlake because we are the No. 1 user friendly website in Africa as we are taking over the world to become the No. 1 user friendly in the world . Contact Us Today For Advert And Get Your Banner Placed On Top Of Our Website . Plot 15 Eziobodo Futo Road, Owerri, IMO State Nigeria. Thank You For Choosing NaijaFlake, we look forward to working with you! !.